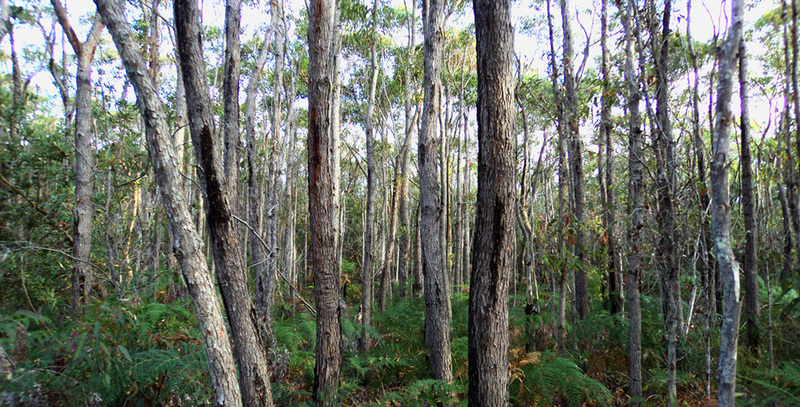 Eastern pygmy possum habitat to be cleared for eco-resort in the Royal National Park! 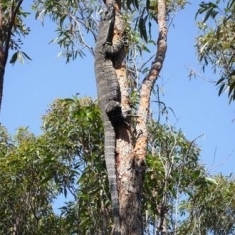 The National Parks and Wildlife Service are publicly exhibiting the proposal for road access to allow the development, including the clearing of hundreds of trees within threatened species habitat, to proceed. None of the significant environmental issues have been resolved in the amended plans. In fact, even more hollow bearing trees are to be cleared due to the extension of the asset protection zone clearing further into the gully. You can read our report on the original application here. View the applicant’s amended plans and reports. Don’t take what we have for granted! 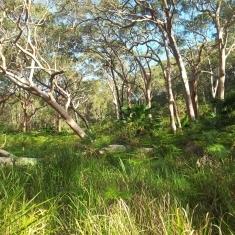 The Spring Gully area contains significant biodiversity and natural heritage of high conservation value. 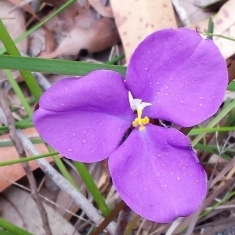 Several endangered ecological communities and threatened fauna species are found on site and in the immediate area. “A total of 366 trees [between] 10 to 40cm are to be removed”. 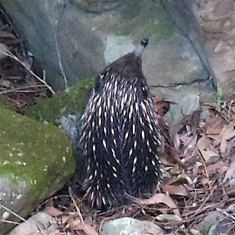 “We propose these lost hollows be replaced by nest boxes”. The impacts will be far worse. 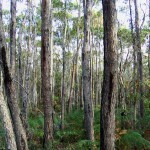 Over 1,000 trees are to be cleared from the proposed inner asset protection zone (IPA) and development footprint, including hundreds of slender bloodwoods which form the unique bloodwood mallee woodland (not found anywhere else in the Royal) that has been cited by Dr Geoff Mosley as supporting the scientific criteria for a world heritage listing of the Park. These trees grow from enormous underground lignotubers that are thought to be hundreds of years old and reshoot after fire. They are a unique adaptation to the relic cliff dune field found in this area. 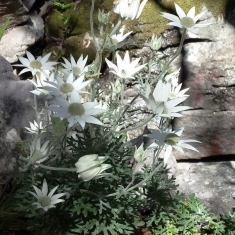 Why Spring Gully needs your help. 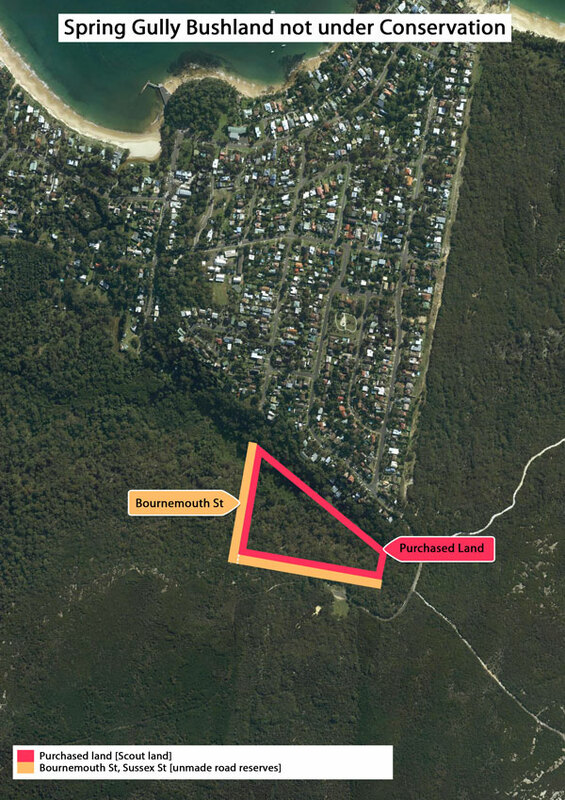 The steepest, most remote, privately owned bushfire prone land in Bundeena, located within the Royal National Park, 0.5km from the end of Beachcomber Ave. Our local RFS brigade oppose development in Spring Gully on safety grounds! In the case of a bushfire emergency requiring evacuation of the site, RFS volunteers and emergency workers will be put at unnecessary risk, diverting precious fire fighting resources away from protecting the town and its residents. 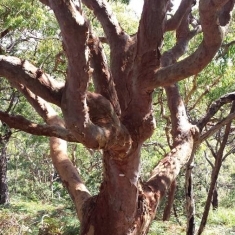 The proposal transfers future bushfire hazard management of this land away from NPWS and RFS onto a private company which has stated there will be no future hazard reduction burns. 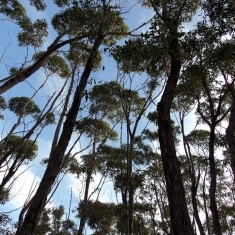 Removal of hundreds of significant trees protected under the Sutherland Shire tree preservation order. 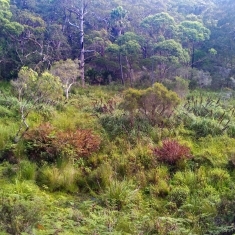 Removal of many hundreds (over 1,000) bloodwoods and old man Banksias from the dense woodland on the upper slope, destroying significant threatened fauna habitat. 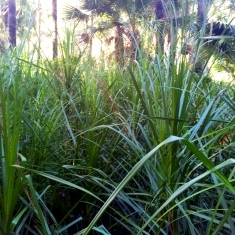 Removal of all small trees, shrubs and undergrowth within an asset protection zone of 7,500 m2, (over 12 residential blocks) that will be three times larger than the old former sanitation depot behind Spring Gully. 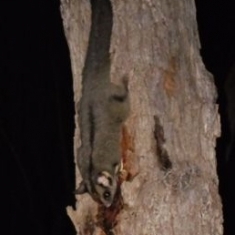 Removal and degradation of habitat for Eastern pygmy possum (threatened species), sugar gliders, ring tail possums including removal of at least 55 trees with hollows and removal of 70% of the tree canopy from the 39 most significant trees (including 19 hollows). 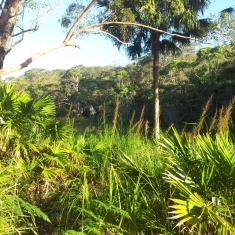 Direct impact of the building envelope extending onto a spring (riparian zone) in an area known to support threatened and protected native aquatic fauna. 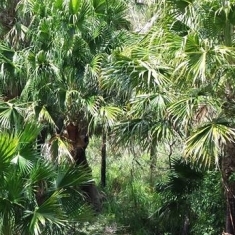 Invasion of development, massive loss of forest canopy and undergrowth, increased human activity. 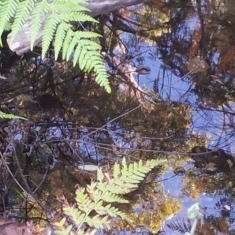 Risks of soil erosion, weed infestation and feral animal predation in an area of pristine bushland. 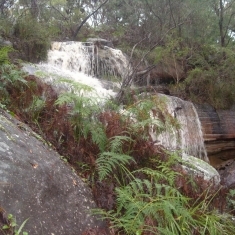 The spread of Bundeena south of the wetland and into the southern side of Spring Gully and the Royal National Park, providing a potential gateway for future subdivision and development. 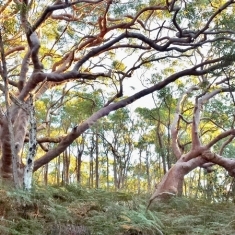 The proponent claims legal entitlement to the relic unmade paper roads (6.5Ha of land in total), holding up their transfer into the legal boundaries of the Royal National Park as requested by NPWS. All this degradation is for a proposed caretaker residence on E2 Environmental Conservation zoned land with the completion of up to six tents accommodating a maximum of 12 tourists to be completed at future stages. 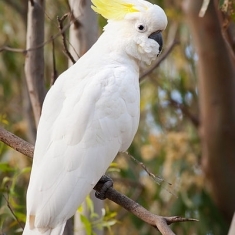 The NSW Office of Environment and Heritage oppose eco-tourism as a permissible use on this land due to its high biodiversity values. 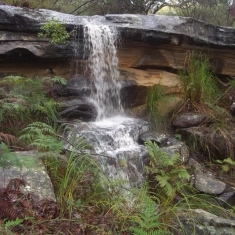 Sutherland Shire Council’s official policy recommends this land be added to the Royal National Park and afforded maximum conservation protection. 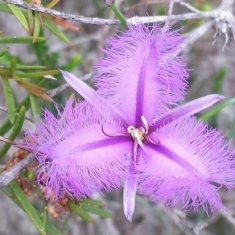 Protection of the Royal National Park and our beautiful and bio-diverse natural environment is central to the Bundeena way of life. Will, on balance, result in a negative net economic, social and environmental outcome for the community. 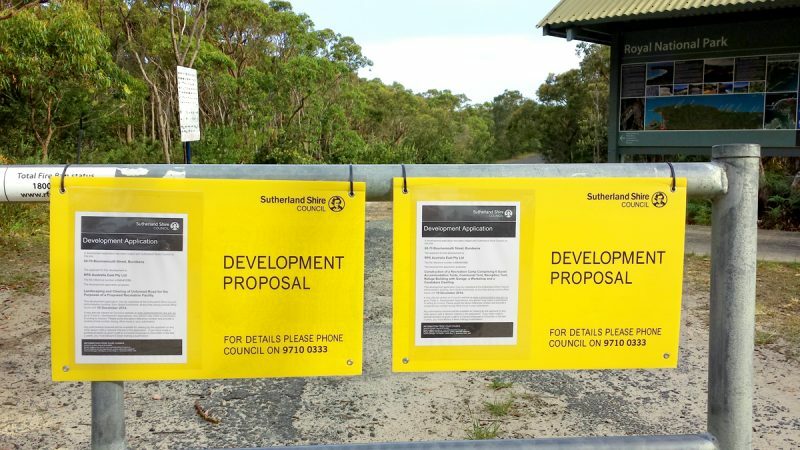 Do not justify the imposition of road access through the Royal National Park, impacting the most popular section of the famous Coast Track, to an in-holding which has never enjoyed legal road access. 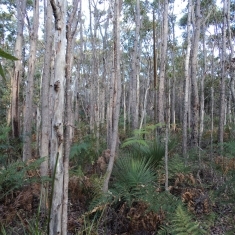 Development applications for a recreation camp on old Scout land and clearing of adjoining land lodged Nov 2014. Council refuse development consent June 2015. Applicant lodges appeals in the Land and EnvironmentCourt June 2015. Council lodged 19 pages of facts and contentions to the court. The Rural Fire Service evaluation raised several bushfire safety defects. 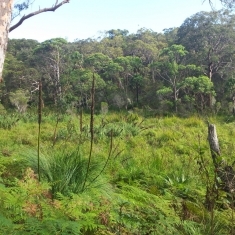 NSW Government rezones the land Environmental Conservation (with eco-tourism permissible) July 2015. Court holds on-site conference with objectors on 20 November 2015. Applicant submits amended plans which are now on public exhibition and open for submissions before Wednesday 20 April 2016. The amended applications substantially fail to address the key issues of unacceptable bushfire risk and unacceptable environmental impacts. The amended applications fail to resolve the lack of legal access to the site. The amended applications do not meet the standards and regulations for eco-tourist facilities. We will be at the library at the times listed below to discuss the proposals and help people write their submissions. Email your submission to ssc@ssc.nsw.gov.au quoting DA14/1238 & DA14/1239 in the subject.